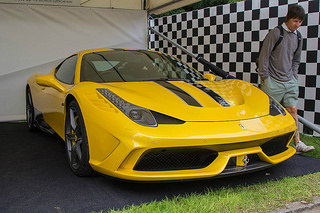 The Ferrari 458 Speciale sports car was launched in 2013 at the Frankfurt Motor Show, with a price tag of £298,000, and was based on the 458 Italia. Externally, the most distinctive feature was the blue and white stripes along the centre of the car. Another interesting feature involved moveable flaps at both front and rear. At slow speeds, the flaps were closed and directed cooling air onto the radiators. However, as speed increased, the flaps opened and reduced drag by restricting the airflow to the radiators. In this way, there was an increase in downforce at the rear of the car. Below the rear grille, the exhaust consisted of two pipes instead of the trio on the other variant, whilst a large rear diffuser further increased downforce. An intriguing addition to the electronic control systems was referred to as Side Slip Angle Control, or SCC, which involved analysing the angle between a wheel's actual direction and that towards which it was pointing, and referring the readings to targeted values. The result was that, by way of F1-Trac, the level of traction control in respect of prevailing road conditions could be mananged, whilst E-Diff, the electronic limited slip differential, would monitor the torque applied to each wheel. The 458 Speciale sports car had a dry weight of 1290 kg, some 90 kg less than that of the 458 Italia, and with specific weight-saving measures, the engine itself was 7 kg lighter. It used the latest Brembo disc brakes with improved pads, which increased heat dispersal and helped produce shorter stopping distances, such as 62 mph to zero in only 31 metres. It was fitted with newly designed 20 inch forged road wheels which reduced overall weight by a further 10 kg. 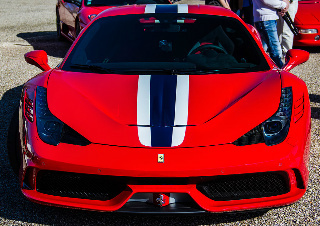 The 458 Speciale sports car was powered by the same 4.5 litre, V8 engine as in the 458 Italia, but output was increased to 597 bhp at 9000 rpm (the redline), and 398 ft/lbs of torque at 6000 rpm. Fitted with a 7 speed Getrag gearbox, it produced a top speed of 202 mph, and a 0-60 mph time of 3.0 secs, with 0-125 mph in 9.1 secs. The engine was the most powerful non-turbo unit produced to date, and used a massive 14:1 compression ratio which was produced by altering the geometry of the pistons, and using lightweight components. The F1-style paddle shift gearbox, with dual clutch, was now fitted with new software, which resulted in the time taken for the engine revs to match the appropriate gear to be substantially reduced. In 2014, a year after the introduction of the 458 Speciale coupe, the convertible variant was launched, and designated the 458 Speciale A sports car, where the letter "A" referred to the term Aperta, which was the Italian for Open. It was built as a limited edition of just 499 units, and with the same engine and gearbox, produced the same 0-60 mph time of 2.8 secs, but the top speed was reduced from 202 to 199 mph. It weighed just 50 kg more then the coupe variant, and used the same automatically operated aluminium hardtop, as used in the 458 Italia Spider sports car, which stored itself away in front of the engine bay in just 14 seconds.